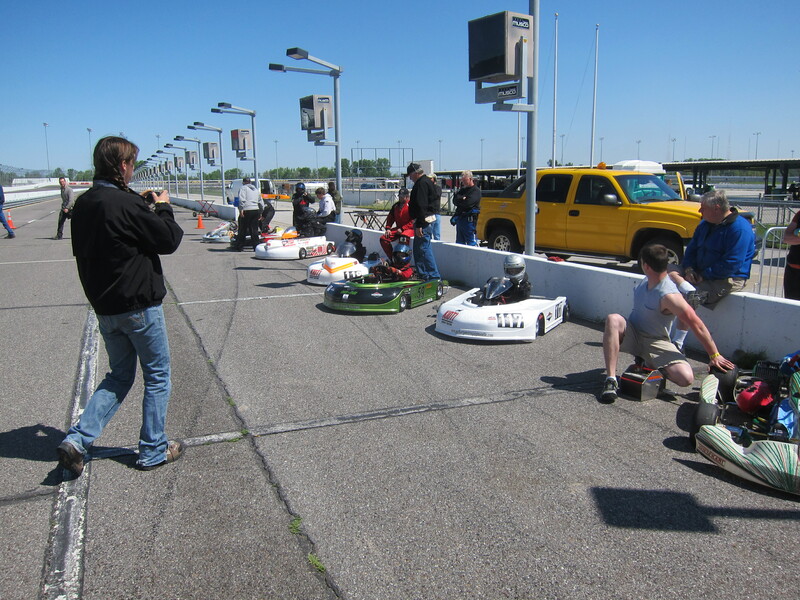 This weekend was our First Championship Enduro Series (CES) race in St Louis at the Gateway Motorsports Park. CES is road racing on a full size race track. Gateway has an oval with banked turns and an infield section for other styles of racing such as karting and motorcycles. While Jason and other folks run standard sprint karts, others race specialized karts that are very long and low so that the driver lays down. Road races are also much longer the a sprint race. They are timed instead of a set number of laps. Jason’s race was 25 minutes, which is almost twice as long as his longest sprint race. This was going to be a interesting change of pace and should provide some valuable racing experience and yet another adventure. Jason and I played hooky on Friday, skipping school and work for the 5 hour drive to St Louis. After a brief stop at the track to register and get a quick look at the track, we traveled on to St Louis to hang out with my Aunt Judy and Uncle Mark and their little dog Toby, and to prepare ourselves for the weekend of racing. On Saturday, after a hearty breakfast we headed out and arrived with plenty of time to set up Wild Duck HQ in the pits and join the drivers meeting. Since Jason was new it was suggested that he go out with “break in” group to get a taste of the track. This is supposed to be a slower run for folks that are breaking in new motors. They ran a a couple of laps slower than usual, and then took off. Lesson learned, though we may do it again if offered. Jason went out for five more 8 minute practice sessions before lunch. Before the 4th session, I changed out the the rear gear to a 59 to eek out a few more hundred rpm and mph. He went out and drove it off the track on the first lap, and had a fun ride on the trailer back to our pit. The last practice session did show some improvement with a top speed of 68 mph and a lap time in the 1:45 range. Coming in to the pits at the end of the session, he had some trouble finding our spot and managed to burn out what was left of our aged clutch. After a few minutes of fretting and pondering, I started asking around for someone who might have a spare we could use. Thankfully, a neighboring driver had an extra clutch and it was even already set up with the right gear. I pulled the engine and after about 30 minutes of work, the kart was ready to go again. The feature race was very short for Jason, he started the race without incident, but came in after a two laps. He complained that his head was hurting and he wanted to stop. I made sure this is what he really wanted to do and then helped him out of his kart. It turns out his new collar was not set up right and was pushing his helmet to the side and pressing on his head. I’m sure he was also hungry and physically tired from the day. It is amazingly difficult keeping a kid fed and “rested” on these very long days, mostly because there are so many other distractions for him. We packed up the truck and headed back to St Louis. I hoped that if we came back on Sunday, it would go better. Sunday’s race day started again with a hearty breakfast from Mark and Judy. We unpacked just enough to practice and race. He went out for the first two of three practice sessions and sat out the third to conserve him and the kart. 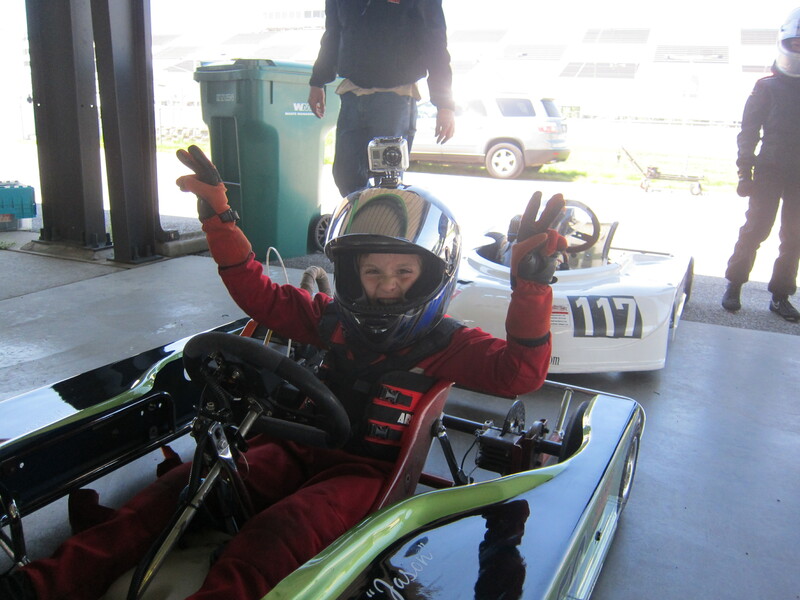 His times where showing marked improvement and the kart was handling great. We were awake, rested, fed, and ready to race. About 11 am, he was on the track for the race. When the green flag waved he was able to get by a few folks and was off and running. While his class’ competition was much faster (1:36 vs his 1:41) he was able to have a very exciting race with a member of a different class. They each passed each other several times each playing off each other’s weaknesses. Every lap they tried to find the faster line to get by the other. 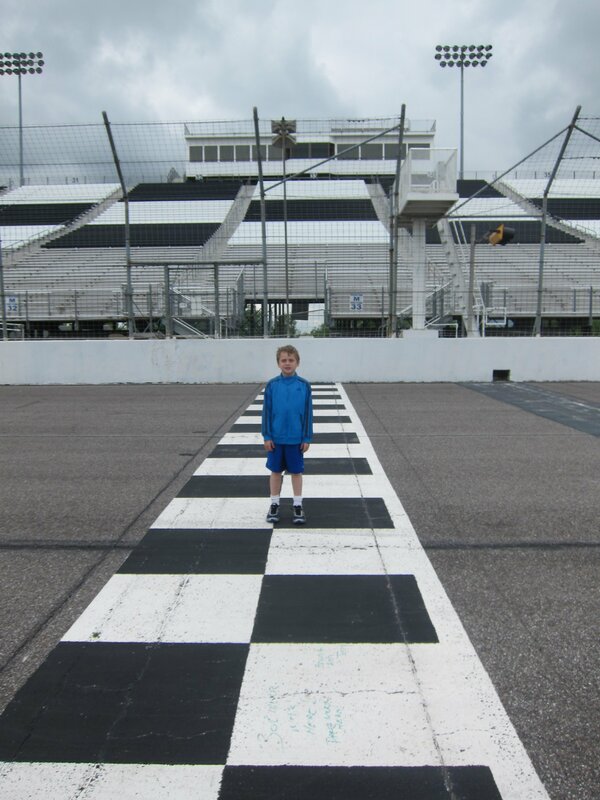 On the last lap, as they ran through the infield turns, the other boy got by Jason. Jason then put his foot to the floor in the big curve riding close behind for a little draft to get by and beat him by a little over a kart length. If you listen carefully to the video above you can here another dad exclaim, “That was worth the price of admission, right there!”, and it was! 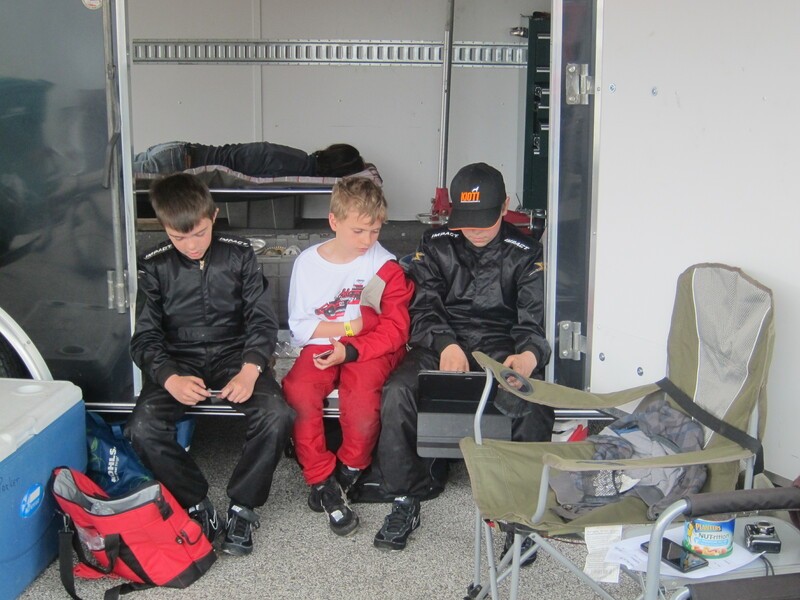 It was really great to watch these boys learn the craft of racing right before our eyes. When he came off the track he was exhausted and said “I am alive, I am alive”. He had to dig deep to endure the 25 minute battle of wills, machines, and “men”. This weekend we really enjoyed hanging out with our kart family. Karting is a great family sport. Every driver usually has a family member as part of their support team, even if it is just moral support. Drivers may battle hard on the track but when they come off they shake hands and help each other get ready for the next race. I often found Jason playing games or just hanging out with his competitors taking about the race. He loves to drive but also really enjoys making new friends at the track. Thanks to Mark and Judy for putting us up and for their outstanding hospitality. To Mike and the Greenwood Restaurant for your support. Ben for the quick clutch help. All the folks at CES for making the weekend happen. And last but not least thanks to our moms. Kart moms are the best! Happy Mothers Day!